Type locality: Island of Sao Sebastiao, Brazil. 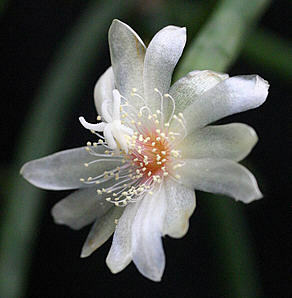 What is probably the original and only clone of the true f. megalantha is still in cultivation (e.g. at Univ. Bonn) and has exceptionally thick stem segments and yellowish flowers to at least 4 cm in diameter. 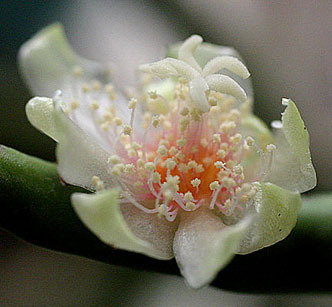 A form with somewhat smaller, silvery flowers and conspicuously pink stamens is also widely distributed in cultivation as R. megalantha and this is intermediate between Lofgren's extreme giant clone (which appears never to have been recollected) and the more typical, somewhat smaller-flowered type of the species. NB. the plant illustrated by Britton & Rose (1923; tab. 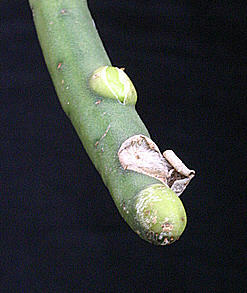 XXJV fig. 3) is referable to R. floccosa. Branches relatively stout, up to 35cm x 8-10mm; scales prominent, usually purple tinged; areoles without bristles; flowers 3-4cm diam., white with pink or orange stamens; fruit globose, 12mm diam, intense purple red, surrounded by woolly hairs.